BigRoad Inc., a leading provider of electronic safety and compliance solutions for the freight industry, and FireStream Worldwide, a leading provider of automation solutions for the downstream and midstream petroleum market announced today a partnership that will provide robust Hours of Service logging functionality to FireStream's DeliveryStream application. The addition of BigRoad's electronic logging application to FireStream's fuel transport management application offers fuel wholesale distribution fleets the ability to create real-time driver logs that are fully compliant with existing U.S. and Canadian regulations. Fleets with regulated vehicles require drivers to produce complex and time-consuming duty status logs, which must comply with the Federal Motor Carrier Safety Association (FMCSA) rules governing HOS (Hours of Service). Failure to complete accurate driver logs can lead to costly fines, vehicle out-of-service time and poor fleet CSA (Compliance Safety and Accountability) scores. Fleet safety scores are a key performance indicator of successful fleet operation and management. The FireStream – BigRoad partnership will enable petroleum wholesalers to operate a compliant business more effectively by delivering immediate visibility into fleet assets utilizing metrics such as vehicle location, driver duty status, cycle resets, personal conveyance and remaining, allowable drive time (HOS rules). FireStream customers will breeze through internal audits and roadside inspections using data-driven, real-time compliant reporting tools. "The biggest impact for our customers in the downstream petroleum market is the enhanced visibility to remaining driver hours in a shift. While helping our customers address a critical component of FMCSA compliance, understanding allowable drive time also assists with effective load management within the fleet," notes Glenn Turner, Founder and CEO of FireStream, "We pride ourselves on being a software and technology company that helps its customers streamline efficiency and maximize profitability through systems automation and highly responsive customer services. The integration of the BigRoad compliance solution to the FireStream platform fulfills that mandate 100%." With the addition of BigRoad to the DeliveryStream application, FireStream customers are delivered a compliance architecture that is forward thinking – planning for their future regulatory needs so they don't have to. With this in mind, the BigRoad-FireStream partnership provides a simple yet sophisticated compliance readiness strategy – particularly for the pending government legislation that requires all transport vehicles be fully equipped with an engine-connected electronic logging solution by 2018. Commenting on the new strategic partnership, Matthew Mossotti, VP of Marketing and Business Development at FireStream says, "This progressive roadmap will allow for our DeliveryStream application to pull data directly from the truck engine through the BigRoad DashLink device. This will be a next-gen game change for our industry." And BigRoad is no newcomer to the petroleum industry. With safety and compliance solutions deployed across multiple businesses ranging from independent Owner/Operators through to large fleet enterprises, the BigRoad solution has long supported the FMCSA Oil-field HOS compliance rules for their customers. 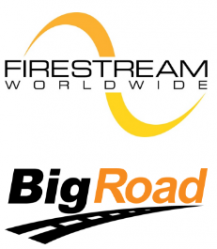 BigRoad respects and understands the critical efficiency and distribution needs of the downstream petroleum market, making this partnership with FireStream Worldwide a perfect fit. "BigRoad is thrilled to partner with FireStream as their preferred compliance partner," says Jake McGuire, VP Sales and Business Development at BigRoad. "We want to give the downstream petroleum industry customers the easiest and most flexible way to take control of their hours of service requirements and manage their CSA scores more proactively. Add Terry Frey, BigRoad CEO and Co-founder, "With BigRoad onboard, FireStream is now the compliant platform of choice for the fuel transportation marketplace – for today and for the future." BigRoad provides innovative and easy to use solutions that simplify safety and compliance for thousands ofdrivers and fleets across North America. BigRoad’s ELD-ready DashLink is the most reliable and affordablesolution available to ensure ELD mandate compliance. With over 350,000 downloads, the BigRoad MobileApp is the #1 electronic logging app for drivers on Android and iOS. For fleets, the BigRoad Web App helpsmaximize operational efficiency with real-time visibility and risk notifications. Over 30,000 fleets have chosenBigRoad as their compliance partner. For more information on how BigRoad can help you get on the path tocompliance, visit www.bigroad.com or call 1-888-305-8777. FireStream WorldWide works with elite petroleum wholesalers, retailers, and distributors in all 50 States and throughout Canada, providing end-to-end automated software and technology solutions to streamline efficiency and enhance profitability. From ERP back office software systems to truck technology and fuel inventory monitoring, FireStream's robust development capabilities provide cutting edge products that perpetually meet the always-changing needs of the evolving industry, giving customers a distinctive edge in the marketplace. For more information, visit www.firestream.com or call 1-800-886-2460.